Included in the first DLC pack for Call of Duty: Black Ops 3, Der Eisendrache returns to the classic Nazi zombies formula. Instead of a demented noir city, you'll shoot through hordes of the fascist undead in a picturesque destroyed castle, filled with strange puzzles and cryptic clues. Of course, there's a massive Easter egg to solve, but we'll save that explanation for another day. For now, here's how to build the Pack-A-Punch vendor, a special device that upgrades any weapon -- for a fee, of course. For more Call of Duty guides, check out our Black Ops 3 Dead Ops 2 Easter Egg Tutorial, or grab every collectible on the Black Ops 3 Intel Locations List. 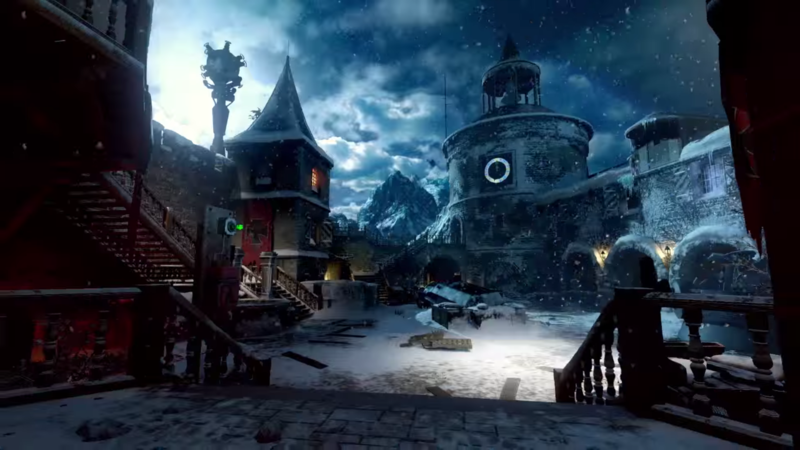 Unlocking the Pack-A-Punch machine is much easier than in previous Black Ops 3 Zombies maps. For this, you just need to follow these steps. Follow the signs with a lightning bolt electricity symbol to find the generator. Turn it on to provide power to the teleportation pads dotted around the map. The parts for the Pack-A-Punch machine are located on three teleportation platforms. Activate the teleporters to make the PaP parts disappear. Once two sets of parts are teleported, you'll need to find the third PaP to automatically construct it. There are only three PaP teleporter platforms. They can be activated in any order, just remember that the third location is where the Pack-A-Punch machine will always complete. One set of parts is opposite the Power switch, just outside the building in the main exterior area of the map called the Bastion. The second PaP parts teleported is found on the large V2 Rocket Pad. Climb up onto the upper catwalks to find the large teleporter platform with the pieces. Travel toward the ancient pyramid-like tomb in the distance and go inside. This location is called the Undercroft. Travel to the third PaP teleporter pad location and the machine will automatically reconstruct itself if you've activated all the platforms. It costs the standard 5,000 points to upgrade any weapon. This time you can also get three alternate weapon colors. Between each round, the Pack-A-Punch teleports to one of three different areas of the map; the Undercroft, the Bastion, or the Rocket Pad. Look for a grey and yellow sign with three lights on it. There are multiple of these signs on the map. If one of the three areas marked on the sign is lit up, that's where you'll find the PaP machine that round.